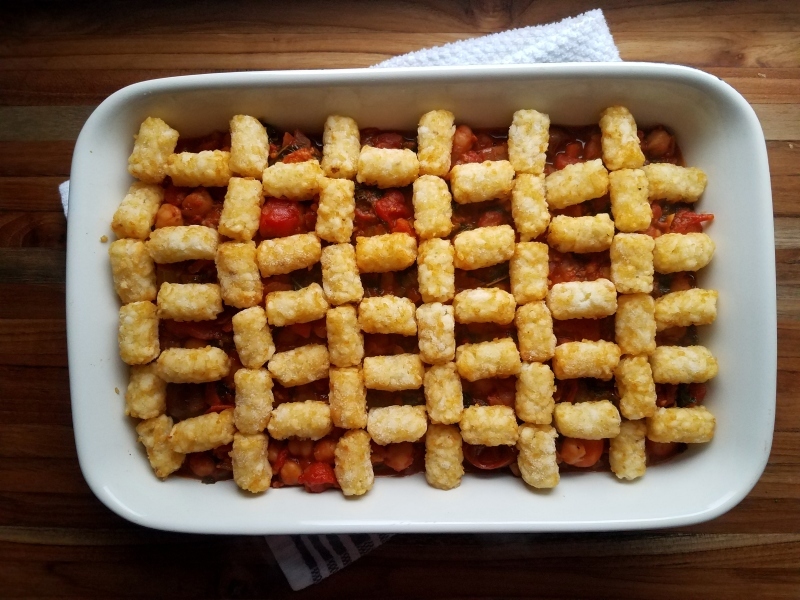 This hotdish, courtesy of Molly Yeh of mynameisyeh.com, is a rare non-compromise. It’s vegetarian, but so filling and complex that you don’t notice (or so I hear). I bookmarked the recipe almost a year ago, but got scared away by the tater tots and ½ cup of olive oil the recipe called for. It sounded heavy, oily, and starchy. Remarkably, it manages to be none of those things. According to Wikipedia, a hotdish is a casserole typically containing a starch, a meat, and a vegetable mixed with a can of soup. Here, the starch is tater tots and olive-oil braised chickpeas substitute for the meat. 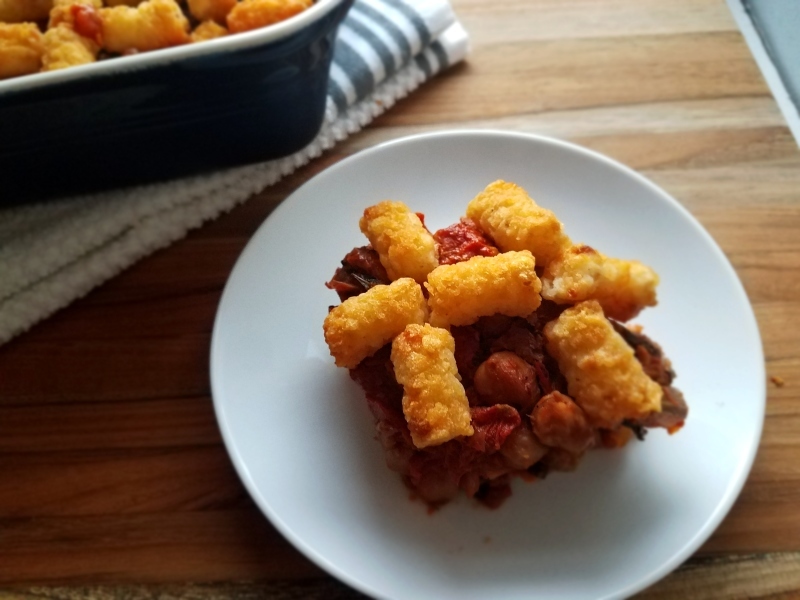 Rather than a single vegetable and soup, the braised chickpeas get mixed with a spicy and vegetable laden tomato sauce and baked until the tots are golden brown. Seriously, it is so so good. Braising the canned chickpeas makes them taste like you remembered to soak dried beans overnight (which I never, ever do) and though the process calls for quite a lot of olive oil, most of it gets drained off (I drained off ¼ cup and used it to make salad dressing). The harissa (a North African chili pepper condiment, I buy mine at Trader Joes but it’s also available on Amazon) gives the sauce a subtle and addicting heat. In short, Molly’s recipe is basically perfect . 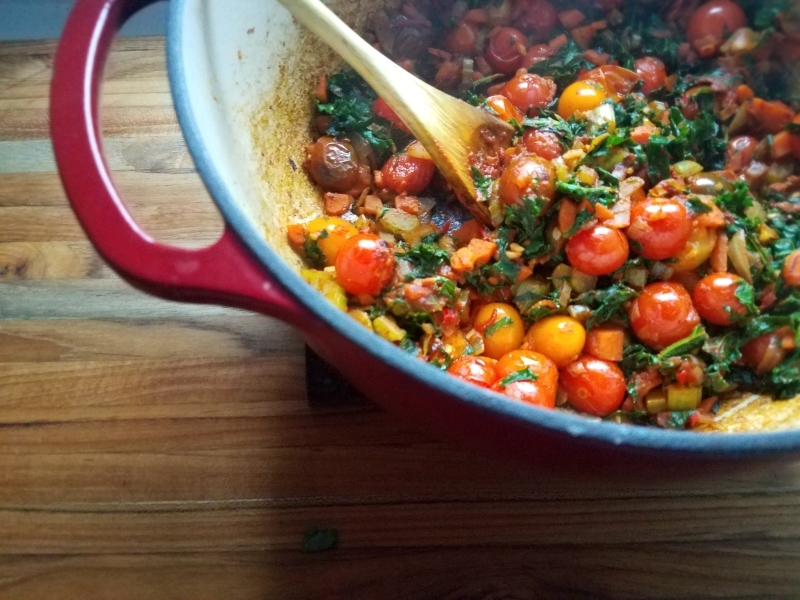 . . but I added kale to increase the vegetable quotient (spinach also works) and some fresh tomatoes to help keep the saucy liquidy enough. If you add an extra 15 oz can of tomatoes instead I am sure it will work fine. Oh, and it freezes extremely well either before or after baking. 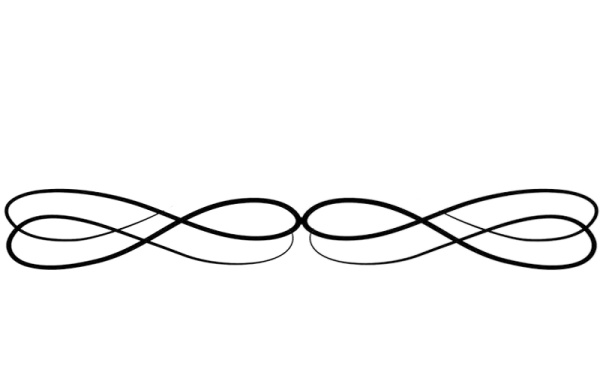 So just make this, ok? In a large pot, heat 2 tbsp olive oil over medium heat. Add the onion and cook until soft, about 5-7 minutes. Add the garlic and harissa and cook for 1-2 more minutes, just until fragrant. Add the wine and cook until reduced by half, about 3-5 minutes. Add the chickpeas, 1/2 cup olive oil, thyme, a bunch of turns of black pepper, and a few good pinches of salt and bring to a simmer. Cover and cook for 35-40 minutes, stirring occasionally, until the chickpeas are soft. While chickpeas simmer, make your sauce. In a separate pot, heat the olive oil over medium heat. 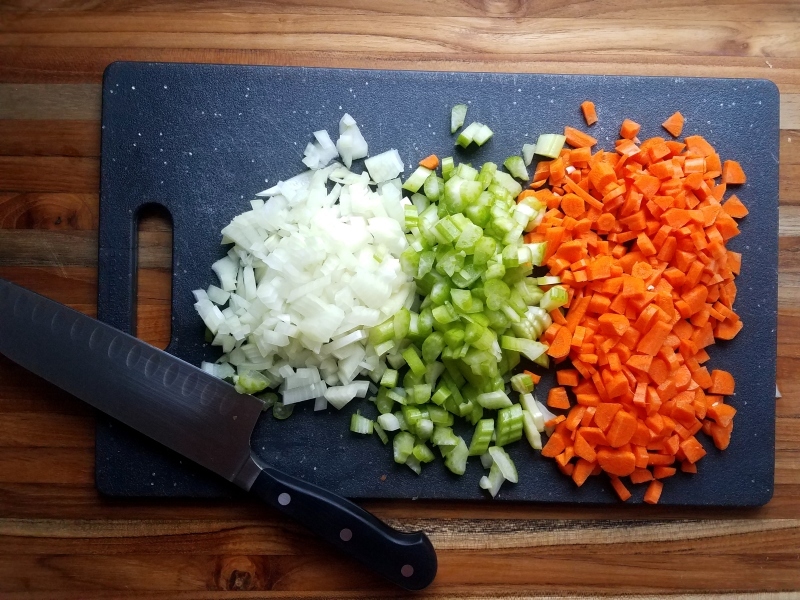 Add the onion, carrots, celery, a pinch of salt, and a few turns of pepper and cook, stirring until soft, about 10-12 minutes. Add the garlic, harissa, tomato paste, and aleppo or paprika and cook for another minute. Add in kale and cherry tomatoes and let cook for 3-5 minutes, until kale is wilted and the tomatoes are beginning to get soft. Add the chopped tomatoes and sugar and cook, covered, stirring occasionally for about 15 minutes. Taste and adjust seasoning as desired. Using a slotted spoon, transfer the chickpeas to the tomato sauce, draining the chickpeas of excess olive oil (discarding the thyme twigs). Transfer the mixture to an casserole dish (mine is 8 x 12 inches and everything just fits) and cover with tater tots. Bake until the tots are golden, 30-40 minutes. Let it cool slightly and enjoy!